Wntd 2 post a pic of DCUC Amazo w/Red Tornado's & Firestorm' wrist attachment accessories, but was not able to figure out how. But it looks great. Yeah, DCUC Amazo is a great figure to reuse accessories with. I have my Amazo with John Stewart's fist construct on his right hand, Firestorm's wrist attachment on Amazo's left hand, and Red Tornado's accessory attached to both feet. That is an AWESOME idea. I'm gonna steal it! Wow. You guys are pretty creative! AMON SUR has a FLASH lightning bolt. SINESTRO has a DEADSTOT muzzle flash blast. ROMAT-RU has a original Sinestro mace construct. I am getting great ideas for my own JLU collection! This is great! Those are great ideas for the corps. 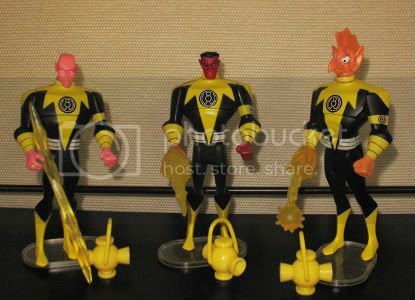 Now I just need to find some original Sinestro maces and such. 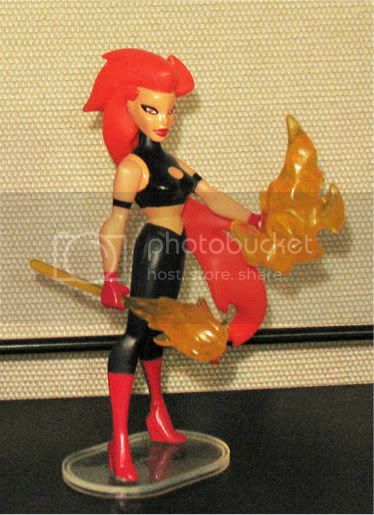 New fire accessory in left hand of VOLCANA made from Wave Rider's hair..
That works perfectly with Volcana. Very good idea! Wish I had an extra Waverider figure so I could try that. In a related note, I've bought a few of those cheap plastic animals at Walmart and had a friend paint them green. Presto-chango, you have more animal forms for DCUC Beast Boy! I have a snake and a boar I did that with, and an alligator from an old Tarzan set I intend to paint green. 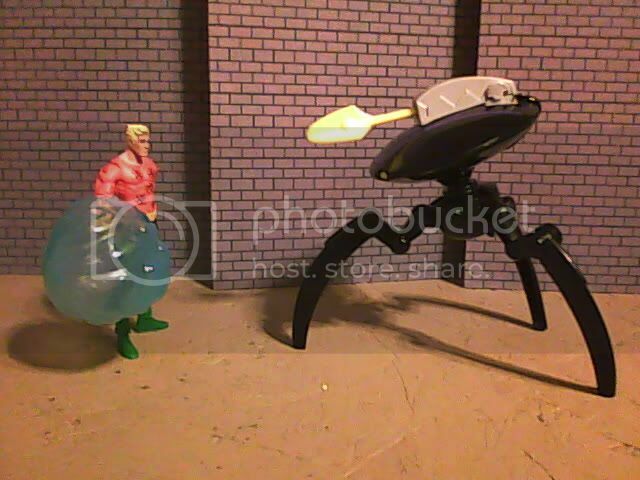 DCIH Starro Aquaman with McDonald's Aquaman's waterball. The scale works pretty good for DC infinite heroes. The Aquaman I know and love doesn't have to rely on fake Water powers he only had in two versions (60's cartoon and BATB) of the character. You have to learn to visualize, man, VIZ-YOU-AL-EYES! JLU quote: "What the heck does that even mean anyway? If I don't visualize a paycheck soon, my wife will have me bagging groceries for a living". Any other s out there? That Black Manta robot from McDonald's looks like it might go great with JLU.